Monopoly: The Card Game takes the best qualities of Monopoly and puts them into a fast-playing card game. It's basically a Monopoly-themed Rummy-style game, but with some interesting twists that make the game unique and compelling. The first player to accumulate $10,000 wins the game! For 2 to 6 players, ages 7 and up. 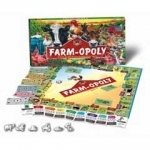 Monopoly Deal is a fast-paced game where your luck can change in the play of a card. It challenges you to collect three property sets, while avoiding having cards stolen by your opponents (and while attempting to pilfer some of theirs). Watch out for the "Debt Collector", "Forced Deal", and "Deal Breaker" cards. For 2 to 6 players, ages 7 and up. Earlier Monopoly card games, including Express Monopoly and Free Parking, are now out of print. Collecting properties and stealing from your opponents is what Monopoly Deal is all about. Players use Action cards to charge rent, trade cards, deny the effects of another player's Action cards, demand birthday money and more! You'll need to put as much money into your personal bank and watch out for other players who will be looking to swipe your property as well. Debt Collectors, Forced Deals, and Deal Breakers can also change your fortune at any time. The winning player is the first player to collect three property sets of different colors. 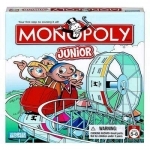 Monopoly Deal is a great family card game that you can take with you anywhere! A review of "Monopoly: The Card Game", from games industry veteran Mattias Gustavsson. Some suggestions for improving the gameplay of Monopoly: The Card Game, from The Games Journal . Rules for Monopoly Deal, as transcribed from an official instruction sheet. 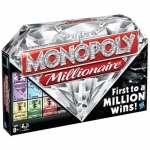 Information and rules for the Monopoly Deal card game, from the free online encyclopedia. Information about the game, as well as rules and variations, from the free online encyclopedia.